Volta introduced free charging for electric vehicles (EV) years ago. And yes, that’s free as in free beer. Still today, there’s a free Volta charging system. Not too many things come free nowadays, but in our recent interview with Scott Mercer, CEO of Volta Charging, we were happy to find that the company is still kicking and making a good business case for free charging. While we are aware how most people feel about advertising, Scott has an elegant solution that should satisfy drivers, business owners, and charging network managers. The idea is to add value that increases business owners’ sales with a free and sustainable amenity. 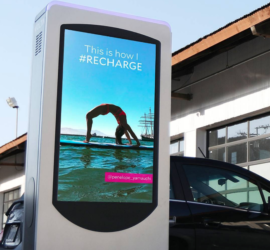 Free Volta Charging Makes A Business Case Around … Well … Free Charging! The largest free electric car charging network in the US is coming to town, and not a minute too soon. Volta wants EV drivers to charge for free and drive without concern where they live, shop, and engage with their own communities. Asked about the unusual business model for a charging network, Scott answered a few questions for CleanTechnica. 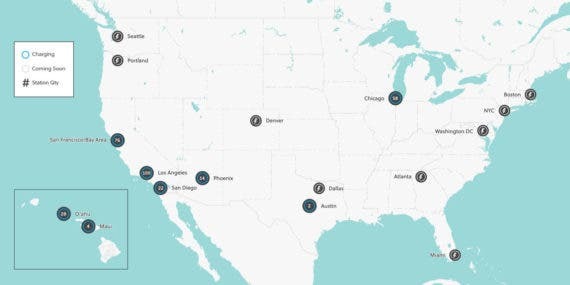 For one thing, Volta is building a financially viable charging network that accelerates the adoption of electric vehicle (EV) by focusing on stripmalls and getting local businesses involved. In order to do that, the company is focusing on social and psychological tools that excite potential EV drivers. And by using targeted and user-relevant advertising, it gives away valuable information and tips to EV drivers. Volta hopes to make advertising useful, rather than just engage in the dreaded shoving-down-our-throats approach of irrelevant information and shady sales tactics. Helping businesses build a better brand image and offering the community valuable tools is something Volta is aiming for. This could get clients back into stores, and encourage owners and businesses to use advertising intelligently. 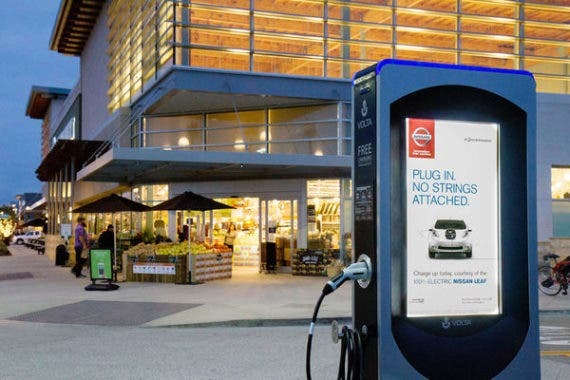 The use of targeted advertising with measurable results can help drive the adoption of a free charging business model as well as get people back into stripmalls. By offering to install and maintain the charging network for communities at high-end, premium retail locations for free, Volta Charging hopes to convince companies to offer relevant information and incentives to EV drivers. This would reward consumers with tailored services and get EV charging and driving out in front of more people, perhaps even enticing new buyers with the concept of free charging. 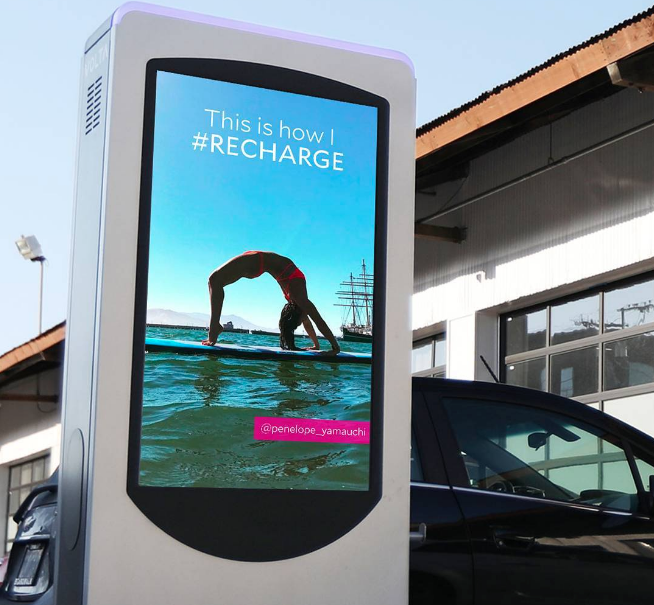 Volta is convincing businesses and charging networks to climb onboard. And after all, why shouldn’t advertising offer something tangible for users and owners? Volta Charging feels that what will help drive the adoption of advertising-based charging is a robust mobile interaction with drivers. By finding out their particular needs, local companies and services can offer targeted content. Drivers would be more likely to use the information and drive to a particular business. That means giving information to those who want it and need it. The problem with modern day advertising is that the information is rarely useful. The trick is to offer relevant information and entice drivers to charge. By offering brands a more powerful and flexible media platform, Volta wants to deliver their messages more effectively while making communities more sustainable. ◊ Related: Electric Car Charging 101 — Types of Charging, Charging Networks, Apps, & More! Although Scott feels there is some competition, it tends to not be localized but scattered here and there. Add to this irrelevant information and you can understand why most people have built advertising filters into their daily lives. Strangely enough, free charging was more common 10 years ago. It is much less so now. There is no real competition when it comes to a healthy and viable free charging business model, as other charging networks have moved away from free charging in order to survive and become financially profitable. Utilities and businesses will have to get on board with EV life and EV charging. Utilities have various approaches for the infrastructure. Some of them are forward-thinking and progressive, while others are still lobbying hard against anything that detracts from outdated business models. We can also see that the deferred maintenance of the grid might play a positive role for Volta since utilities have to upgrade sooner or later. Retail owners are looking for ways to attract loyal customers who shop more frequently and stay longer. Offering free charging with shopping incentives would attract these customers and make it easier for them to shop. So far, the reaction has been a welcome win, win, win. A free charging service attracts EV drivers while giving them relevant incentives. Business owners attract more clients and network managers grow their distribution. According to Scott, there is a trend away from using expensive charging stations. The Volta charging stations would have basic content and have no interactions. Sponsors and retailers will offer relevant information for consumers and draw them to shops where owners will recoup the advertising. But Volta also sees social media as playing a big part in reaching out to EV drivers. In essence, Volta Charging wants to offer a 100% turnkey solution. It will install stations and provide maintenance, as well as technical support. Businesses will not have to worry about anything else but content. Volta says it will take care of all costs associated with installation, maintenance, and electricity usage. 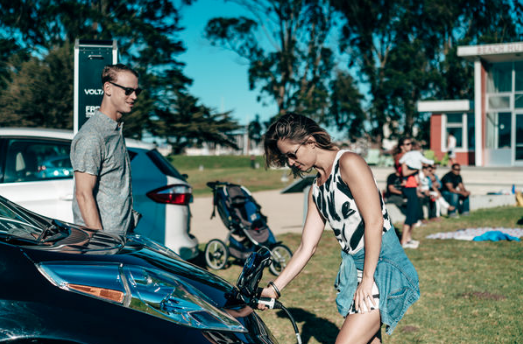 Volta feels it is pushing the charging infrastructure forward, as well as EV adoption of course, by offering free charging. The hardware is designed by Volta and made the USA, by the way. Scott actually rides a Brammo motorcycle, drives an electric Fiat, and occasionally drives a 1971 Alfa Romeo. The company stations pump out 30A at Level 2 charging specs, giving an estimated 20 mile range for over an hour of charging. This gives the company a 2.5 LEED points for sustainability. You can follow Volta on Facebook, Google+, LinkedIn, Instagram, and YouTube. Charging for free is certainly appealing to EV drivers. It should also make sense for business owners as long as they can offer relevant and targeted information, as well as incentives. 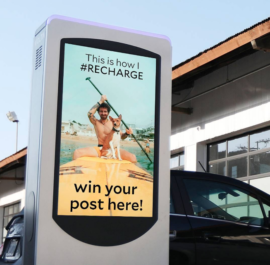 Overall, Volta Charging’s advertising-funded charging system seems to make a good business case that serves EV drivers, Volta, and advertising partners. It is not surprising that similar business models have popped up in Ukraine and Poland (stay tuned for more on this topic).